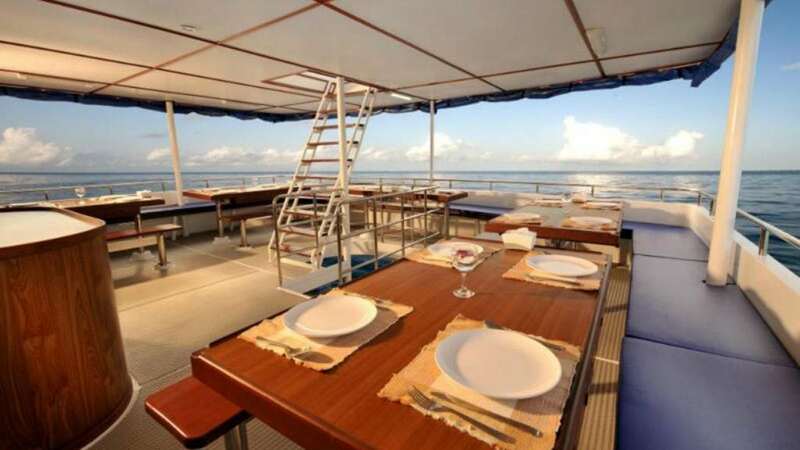 The KM Raja Manta is a stable 37m (121ft) long steel diving liveaboard. 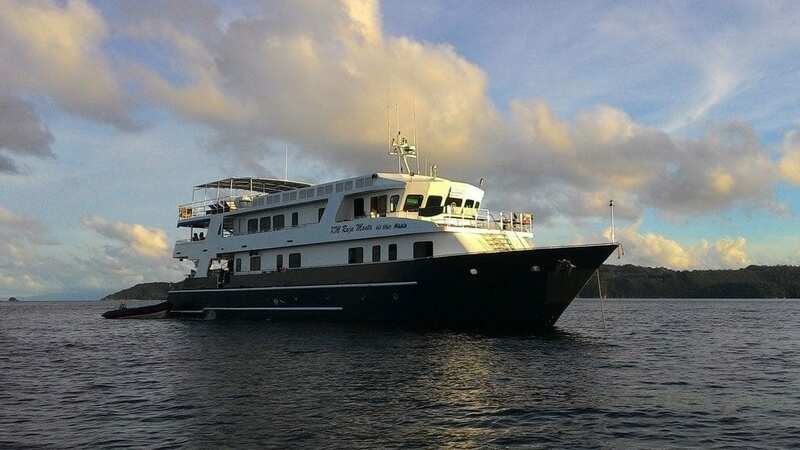 She operates 6-7 night dive cruises in Raja Ampat and East Kalimantan. 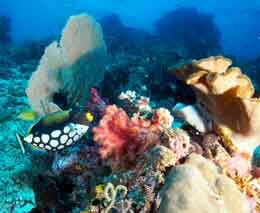 Raja Manta is located in Raja Ampat from January to May and in East Kalimantan from June to August. There are extended relocation cruises when she transfers between these areas through the Banda Sea, Ring of Fire and the Forgotten Islands. These re-location cruises visit some of remotest places that are only accessible on liveaboards. 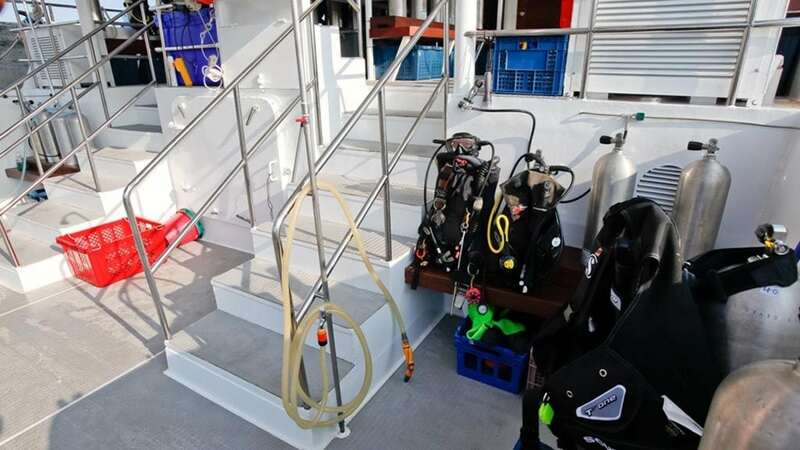 Raja Manta accommodates up to 22 divers in 11 cabins: 8 En suite double/twin share cabins and 3 Standard twin share cabins with shared bathrooms. All 8 en suite cabins are located on the main deck and upper deck and have ample storage space for luggage with camera table as well as a spacious toilet with hot water shower, air-conditioning with individual control and a large window that can be opened. 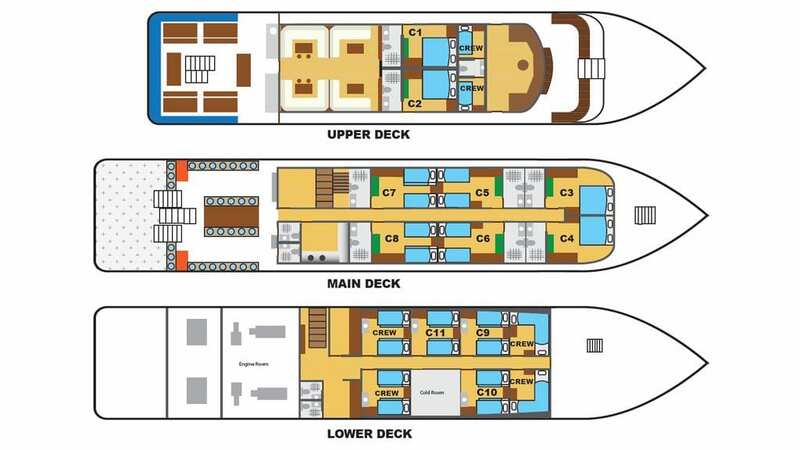 There are 2 en suite cabins with king size bed on the upper deck and 2 of the same on the main deck. 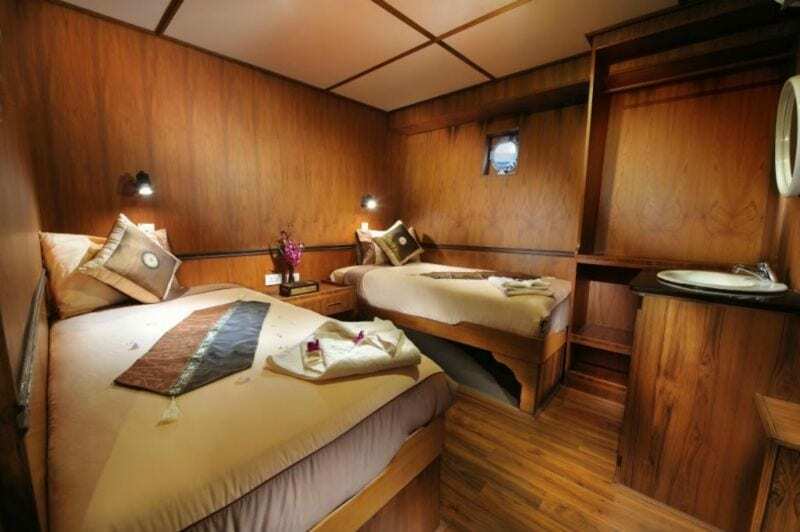 Another 4 en suite cabins with twin beds are also located on the main deck. 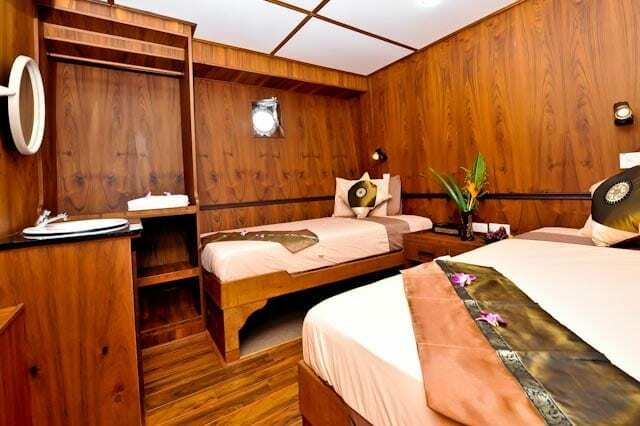 The 3 standard cabins are below deck and have a wash basin each, twin bedding and portholes that open. 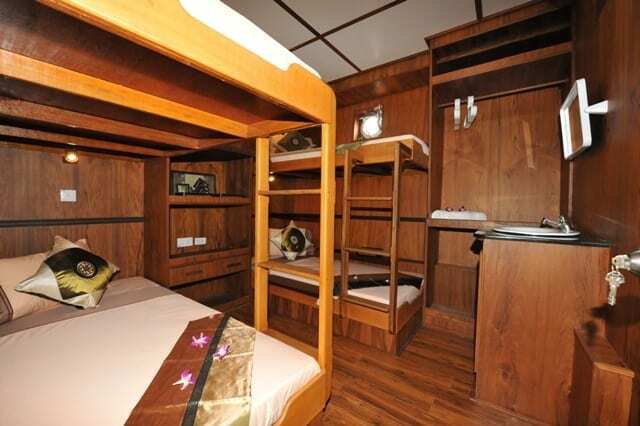 These cabins share 2 communal bathrooms with toilet and shower also on the lower deck. The vessel is air-conditioned throughout. There is also a spacious saloon with 42″ Plasma TV and DVD player, a huge outdoor dining area and sun deck with deck chairs and floor mattress for massages. 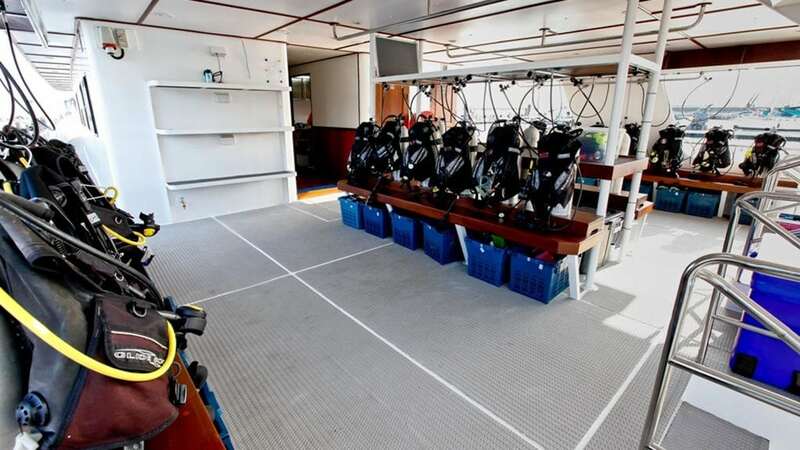 The main deck also houses the dive deck which offers ample room for everyone to gear up. A camera table and rinse tanks are available. Electricity is 220V with 110V adapters available. Sockets are 3 pins British standard and 2 pin Thai standard. The crew on-board the KM Raja Manta are very experienced, friendly and hard working, and divers are quickly put at ease by their helpfulness. Aluminium tanks with international fittings (DIN adapters available), weights and Nitrox are available on board. There is also a 20,000L fresh water tank and two water makers which make 4000 litres of fresh water per day. Two rubber dinghy’s (5.8m) are available as chase boats. 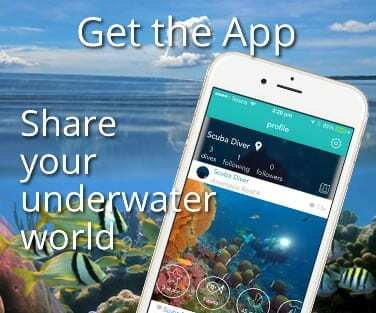 Selected dive courses are also offered: Nitrox, Advanced OW, PADI Wreck diver or digital photography. Raja Ampat or ‘Four Kings’ is a true divers paradise, a wonderland lost in time, incredible natural beauty dominates above and below the blue waters; steep jungle-covered limestone islands, stunning white sand beaches, hidden lagoons, and dense mangrove forests combine to create over 9.8 million acres of National Park. 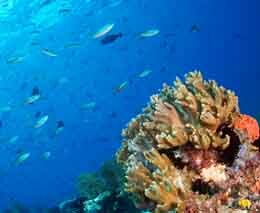 Underwater more than 1000 types of reef fish, 540 types of corals, sharks, Rays, turtles, dolphins and even whales call the park their home. 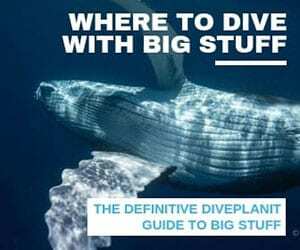 This is the holy grail of dive destinations, truly one of the most beautiful places in the world. Sangalaki: Famous for large aggregations of Manta Rays who use the islands surrounding colourful reefs as a cleaning and breeding ground, in certain conditions Whale Sharks can also be spotted. Kakaban: A stunning freshwater Jelly Fish Lake fringed by virgin Mangrove forest, Sheer drop offs and walls that attract Huge schools of Trevally and Barracuda along with the possibility of Hammerhead, Grey Reef and Black Tip sharks. 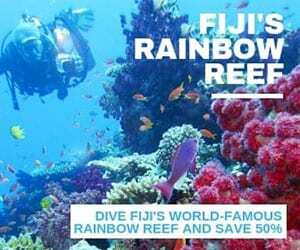 Maratua: One of the most action filled destinations in the region, The walls that surround this island provide some great Big Fish dives, massive schools of Chevron Barracuda, hunting Trevally, Thresher sharks and much, much more! 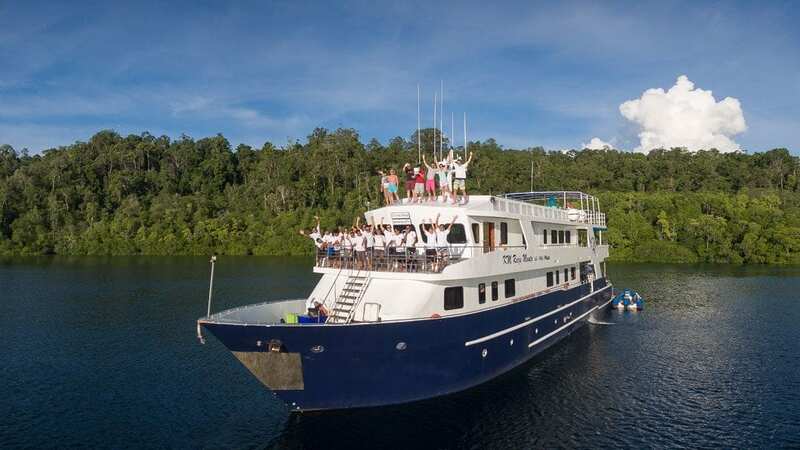 Ambon, Banda Sea & Forgotten Islands: From September through to December, the KM Raja Manta embarks upon once in a lifetime voyages across the Banda Sea, visiting the famed ‘Spice Islands’ to discover diving Nirvana in the ‘Ring of Fire’. This is diving as it was meant to be enjoyed, true exploration, away from the crowds, discovering dive sites that very few divers will get a chance to explore; discover unique and spectacular scenery both above and below the waves where volcanic activity has created a remote island paradise, only accessible to divers via liveaboard. With their unmatched experience in this area, they can show you just what an incredible destination this is and take you to their ‘Hammer head hot spots’ where at certain times of the year schools of more than 200 Hammerheads have been witnessed. Besides the schools of Hammerhead sharks, you will find pristine coral reefs, unique local seaman in Alor, the great show of volcano eruption in Komba, tons of sea snakes in Manuk and a visit to the spice island in Banda Neira. 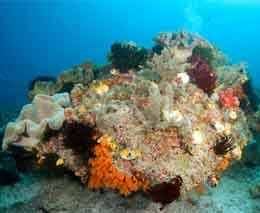 Ring of Fire: Ambon, Banda Sea & Forgotten Islands (Sep-Dec); Hammerheads galore along with whales, dolphins, mantas and more. There is no satellite internet available. Please bring enough cash to pay for any trip extras. Currencies accepted for payments are USD, Euro, Singapore Dollars and Indonesian Rupiah. Note: Banknotes must be in good order, not worn or torn and unmarked. Visa and MasterCard payments are also accepted and incur a 4.5% processing fee. The boat is comfortable and spacious and has a high service level for a boat in its price range. It’s relocation cruises are definitely something very special.